In February 2019, the Tata Tigor received ABS with EBD and CSC as standard fitment across all its trims. 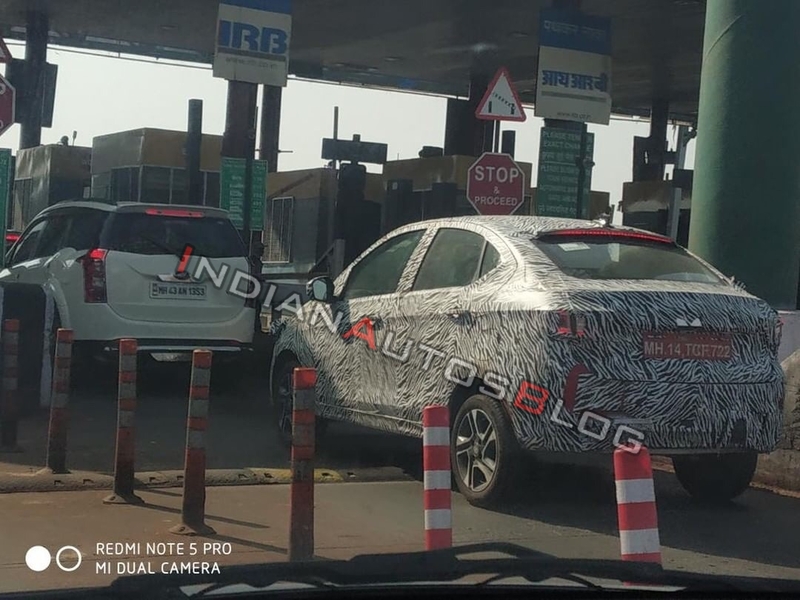 Now, in a fresh development, IAB reader Ashu has spotted a test mule of the BS-VI compliant 2020 Tata Tigor (facelift) on the Mumbai-Pune expressway. Completing three years in the market at nearly the same time as the BS-VI deadline, the Tata Tigor's BS-VI upgrade is likely to coincide with its facelift. So far, the Tata Tigor has been available with two engines - 1.2L Revotron petrol that develops 85 PS and 114 Nm and 1.05L Revotorq diesel that produces 70 PS and 140 Nm. The petrol variant is available with two transmission options - 5-speed manual and 5-speed automatic. The oil-burner comes mated to a 5-speed manual transmission. Last month, it was reported that Tata Motors will discontinue the diesel engine variants of the Tiago and the Tigor as updating them to achieve BSVI-compliance will make them too expensive. The Tiago-based sub-4 metre sedan has been on sale in five trims - XE, XM, XZ, XZA and XZ+. The Tata Tigor was launched in March 2017 and received a minor cosmetic update in October last year. Its range-topping configurations feature a diamond-look front grille, projector headlamps with chrome finish, 15-inch dual-tone alloy wheels, LED tail lights, shark-fin antenna, faux leather upholstery with contrast stitching and a 7-inch touchscreen infotainment system. Completing three years in the market at nearly the same time as the BS-VI deadline, its BS-VI upgrade is likely to coincide with the facelift. Tata Motors is working on a BS-VI compliant 1.2-litre Revotron three-cylinder petrol engine for the Tigor, but it will not upgrade the 1.05-litre Revotorq three-cylinder diesel engine. Tata Motors is readying even a mid-cycle facelift for the Tiago. New models from the homegrown automaker arriving this fiscal will include even the Altroz, a Maruti Baleno rival, and the Buzzard/Cassini, a 7-seat C-SUV that is basically an extension of the Harrier.